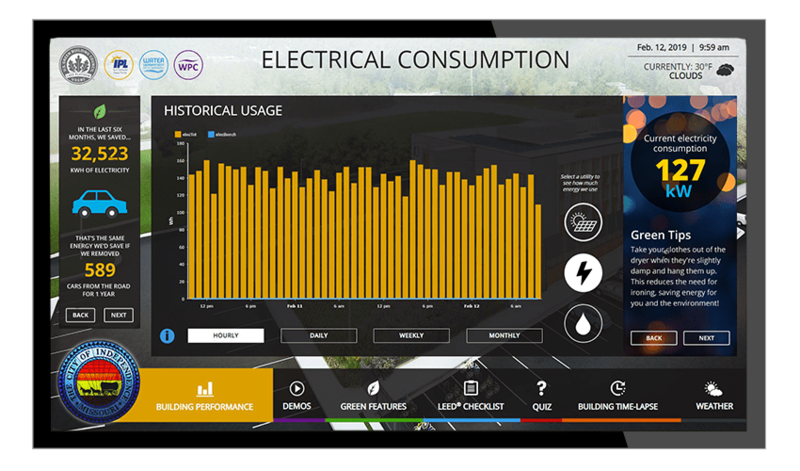 QA Graphics, creator of the award-winning Energy Efficiency Education Dashboards®, will be exhibiting at the Green Schools Conference & Expo x IMPACT to share their creative design capabilities and energy dashboard with hundreds of green leaders. The Green Schools Conference & Expo exhibit day will take place April 9th at the Saint Paul RiverCentre in Saint Paul, Minnesota. Attendees are invited to visit QA Graphic’s booth, #T5 to learn more about the company and their HTML5 Energy Efficiency Education Dashboards® (EEED) v6. Over the last decade, QA Graphics has been providing these solutions to numerous businesses, schools, universities, restaurants, and healthcare facilities. The EEEDs are used to help educate occupants and the general public on sustainable building practices. Thanks to the live data collected from the building occupants can gain insight on how their actions impact their surroundings, creating a sense of personal responsibility to make more sustainable decisions. To display real-time data, our solution integrates with existing automation systems and does not require custom software or an internet connection, therefore eliminating security risks. Ownership of the EEED v6 allows the client to control and maintain the building within their IT protocols, and each dashboard comes with a Content Management System (CMS) that’s catered to their needs using a WordPress ® platform. To learn more about the Energy Efficiency Education Dashboard®, please contact 515.965.3403 or visit qageeed.com.